That Vera Brittain chose to name her autobiography a Testament, at first seems like an assertion of her intellectual inclinations, particularly in light of the decision she made to pause her hi-brow Oxford University studies when the First World War began as her closest friends, her fiancé Roland and brother Edward all signed up to participate, one by one departing for France. She had fought hard to be accepted into Oxford, at a time when women were not exactly welcome, her own family and many of their social peers thought it a waste of time. It remained important, but while those she was closest to were sacrificing everything, it felt indulgent to be pursuing anything intellectual. She volunteered to become a VAD (Voluntary Aid Detachment) nurse as she sought the diversion of physically demanding work to lessen the idle hours of mental anguish concerning her male contemporaries at war. Testament is more than one woman’s intellectual account, it is evidence of a generation’s stunted youth, a youth stolen by war and loyalty, one that for the men who participated, would continue to be acknowledged and remembered, their efforts appreciated and honoured. 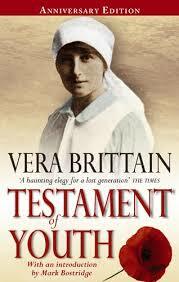 For Vera Brittain it would bring grief, disappointment and disillusionment. She recalled one of her last bittersweet moments, punting up the river in Oxford with her friend Norah, whom she would not see again after the end of that term. ‘No evening on the river had held a glamour equal to that one, which might so well be the last of all such enchanted evenings. How beautiful they seemed – the feathery bend with its short, stumpy willows, the deep green shadows in the water under the bank, the blue, brilliant mayflies which somersaulted in the air and fell dying into the water, gleaming like strange, exotic jewels in the mellow light of the setting sun. 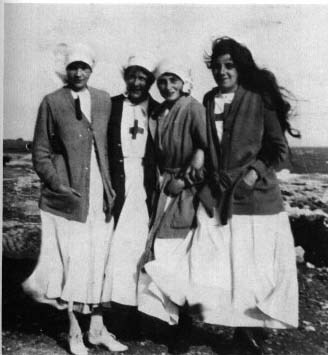 Her nursing efforts took her out of the northern provinces of England for good, away from her studies at Oxford to a military hospital in London, until events would propel her to volunteer for a foreign assignment, taking her to Malta and then close to the front line in France for the remaining years of the war. Her account is all the richer for the journals she kept from 1913 to 1917 and rather than present them in full, she selects extracts to bring the era to life, sharing the angst and idealism of her youth, simultaneously looking back and narrating from the wisdom of early middle age, for she was 40 years old before she would finally see the much revised autobiography in print. The book contains snippets of letters to and from Vera and her fiancé Roland and her brother Edward, they were her life blood, her motivation to face the relentless days in the hospital, where their work offered so much and yet did so little to stem the flow of blood and severed limbs, pain and hopelessness. The letters that pass between Vera and Roland reveal the slow loss of hope, optimism and valour as they struggle to find meaning in war. Despite the often depressing content, they are fortunate to have each other, writing letters prolifically, drawing each other deeper into a love that they knew could be destroyed on any day. After the war, Vera returns to Oxford and finds herself isolated. She has difficulty articulating her experience in a way that is understood and instead invites scorn and derision. A new generation of youth has swept up behind her and they have little time for the lessons that might be gleaned from a mature student who forsook her youth for volunteer nursing abroad. She gets involved in the debating society, and in one of the more excruciating passages in the book, valiantly tries to prove her point only to discover it will be she who is taught the lesson. Vera’s hope and her life purpose after the war, was to try to understand and then participate in any action that could prevent humanity from making the same terrible mistakes that caused the loss of so many lives. She changed her focus from Literature to History and searched for proof of anything that had been put in place to prevent such destructive hostilities from wiping out a generation of youth. She found what she was looking for in treaties and agreements and became an international speaker for the League of Nations attempting to advance understanding and awareness among the common population. The book impressed me with its honesty, particularly as Vera Brittain was not afraid to portray her flaws; through the extracts from her journals we have a real sense of the character she was in her twenties and though she is the same person after the war and we recognise her inclinations, her direction in life is permanently altered by the experiences of those years. The combination of experiencing the present through her diary and letters and her observations from the maturity of having survived war and gained some distance from it, from which to observe her former self, provides the reader a unique insight into humanity. For me, it was a gripping read and although we learn much of the story in the opening introduction, it does nothing to lessen the effect as we witness Vera receiving news she has dreaded from the beginning and more than the individual events, the observation of emotional ups and downs and the effect of war on a generation seen from a young woman’s perspective is more insightful than any rendition of battles or victories I have ever read. If the prospect of reading a 600 page book seems daunting, look out for the movie coming out in 2015! This entry was posted in Classic, Memoir, Non-Fiction and tagged 1914, autobiography, book review, books, History, nonfiction, Testament of Youth, Vera Brittain, women, World War 1. Bookmark the permalink. Sounds fabulous actually. Thanks for the review. It’s an astounding account and worth the long read, I am looking forward to seeing how they handle the film, it has such great potential. Yes, hopefully it will be well done. Turning books into movies can be iffy. I am definitely going to read the book. Brilliant review. Testament of youth is a really remarkable memoir and you capture it perfectly. I await the film with interest. Thank you, your reading of it earlier this year spurred me on to pick it up, there is so much more than one can cover in a review and I really wish she’d written a second volume about her life post war and been able to be more open about her decision to remarry, it seems her husband censored out a lot of her initial writings about their relationship. it must have taken something powerful for her to overcome her initial reluctance to marry. Yes I’m sure it did. I like to think she was happy. I’m not sure what period het book Testament of Friendship covers but I think as I’m a fan of Winifred Holtby I need to go on and read that too. Testament of Friendship sounds like an incredible heart-felt tribute, I think it covers the period from when Vera met her at Oxford up to her death. Sounds like it is incredibly sad as well. What’s just as sad is how little known these forward thinking women are today. I hope that’s going to change with the film coming out anyway. She did write a second volume about her life post war, called “Testament of Experience”. It’s not as poignant as “Youth”, but you clearly are an afficianado, so I do recommend it. There’s also her biography of her great friend Winifred Holtby, called “Testament of Friendship”. As the title suggests, this covers a duality, so gives a lot of detail on Vera’s own life in the post-war years. It is actually very enlightening on Vera, as they lived together until W’s untimely death from kidney disease. Then there are VB’s WWII books, of which “England’s Hour” is most moving as it describes the evacuation of her children, one of whom is Shirley Williams, to the USA. Like you, I was spellbound when I first read “T of Y”. Along the forty years since my first discovery, I have read just about everything else she wrote, including a few novels (not her best work), journalism – “Testament of a Generation” and pacifist letters in WWII, “Testament of A Peacelover”. The more I read, the more I was impressed by her incredible intellect, and her courage. I am really looking forward to seeing the new film, which I have scheduled for 12 Feb.
Vera also convinced me that it was possible to love clothes, and still be intelligent – I always remember her description of the clothes she carefully chose to meet the man she finally married ! I expect you know that her daughter was also a peace activist – Shirley Wiliams, Labour MP? Thank you so much for sharing your reading experience Valerie and for telling us about your step-grandmother, there must have been so many young women who suffered from losing the men they should have married. I heard a similar story this week from a friend whose grandfather was the only son of a large family to return from the first world war and that all his sisters lost fiances and none of them every married. It is hard to imagine how those who survived could cope and it was so very sad to read of the lack of acknowledgement of the effort of women volunteers when Vera returns to her studies. Her autobiography is a gift in that respect, she has gained more than she could ever have dreamed and it continues today. I don’t know much about Shirley Williams, I saw she wrote an introduction in my copy and Susan mentions her below as well. And yes, I could have continued and written more about Winifred Holtby, what a great friend she was, I would love to read her first book, as well as the one is most well known for. So tragic to hear she died so young, but wonderful that she was achieving her dream and being published and was as prolific a speaker as Vera. I just bought it for my kindle. Thank you for all the wonderful books. How do you have the time to read them all? We will be back in Provence in November. Coffee? Thanks Judy, it’s a book a week my goal and sometimes I don’t know either how I manage it, as I usually only read at night, but I read a little every single day, and so wile I don’t think I read a lot, I read consistently, I love it so much! Thank you Claire, this sounds wonderful. I’m enjoying The Summer Book by Tove Jansson. Great to ear you are reading a wonderful Tove Jansson book during her anniversary month Valorie. I hope you manage to read Vera Brittain’s book, it is an insightful account not just of war, but life thereafter and all the more so for the era in which she lived. It is a remarkable book …great review. Thanks, so glad I dusted it off and made the effort to read it. I do hope the film is well received and gets more people reading the book too. Wonderful review, Claire. This book sounds very powerful and rewarding, and I like the idea of Brittain using extracts from her journals to paint a picture of the era. Looking forward to the film already. Thanks Jacqui, the journal extracts really put the experience into the present even though she writes it from a distance. It reminded me of what Cheryl Strayed did with her popular memoir Wild, an account of one woman walking the Pacific Crest trail in the US but she publishes her memoir when she is 40 looking back and using extracts from a journal. It is a method that works really well. The film will be interesting and I hope it generates more interest in the book and in her friend and fellow activist Winifred Holtby. A very thoughtful review, as ever, Claire. I think the idea of public service was deeply embedded in Vera Brittain’s character and life, something she passed on to her daughter, Shirley Williams, who was once a Cabinet minister for Labour and is now a very active Liberal Democrat peer. Vera lost so much due to WW I, her loves and her youthful innocence. I was impressed how she continued as you said to “prevent humanity from making the same terrible mistakes”. I found this quote while reading Writer at War and it could pertain also to Vera: “If you want the present to be different from the past….study the past (Spinoza). Thank for the wonderful review in which you mentioned “She changed her focus to History” so she could study the past. Beautiful review, Claire! This looks like a wonderful book. It must have been amazing when Vera Brittain got into Oxford and it is even more amazing that she left it halfway through to volunteer as a nurse in the First World War. I loved that passage that you have quoted about Vera and her friend Norah punting up the river. I also loved Valerie Davies’ comment on her step-grandmother – it was very poignant. Thanks for sharing your thoughts on this beautiful book. A fantastic review. I didn’t know about the movie so I need to sort myself out and read this soon. Thanks for pointing me to your thoughtful review, Claire. I do wonder if the film will stay true to the original. We so often find that, when people have suffered extremities most of us don’t like to think about, it’s so hard to return to ordinary life. Vera was being true to herself in trying to educate the younger students if it sounds like to them she was neither the tragic heroine they could eulogise nor able to put the past behind her and move on – no wonder so many survivors keep quiet. It sounds almost like culture shock. Your review emphasises so well the confusion arising from a youth interrupted – it seems we send young people to war at the worst possible time for their psychological development yet, at the time so many see only the excitement and adventure. Thank for returning the visit Anne and I do hope you pick up Vera Brittain’s autobiography for an interesting perspective of involvement in and surviving war. I think she did an excellent job eventually of finding a place in life which allowed her not to forget and more than this, to be active, plus she was most fortunate to have the supportive friendship of the writer Winifred Holtby. Interestingly after this book I read Simone DeBeauvoir’s Memoirs of a Dutiful Daughter, which I am still thinking about before writing up a review, she was 6 years old during WW1 and as she becomes a student, she has a vague awareness of her father and friends talking politics and league of nations, which she deplores and finds uninteresting, she is more interested in the self and as I read her words, I thought, this is exactly the kind of attitude Vera Brittain had to confront. But is this perhaps part of the gains of war, to preserve the right of the individual to be free in thought, even if it means having little appreciation or gratitude for those who allowed them to have it. I will find out when she has to survive the effects of WW2 I guess. Your last comment is especially interesting given current times, when so many youth are disaffected and living without meaningful employment and young men in particular are in their most idealistic phase of life. I don’t find it surprising that a small minority are abandoning their lot and becoming rebels in other countries, it doesn’t carry the same feeling of pride, as they go without consent, without encouragement and with the knowledge they are destroying their past, but men have always found glory in going to fight for a cause they believed in – until they become disillusioned with that also. I’ve never heard of Memoirs either! Just added it to my list! Such an interesting review, and lots of fascinating comments too. I do agree with you that it’s such a shame “how little known these forward thinking women are today”. As you say, the film might trigger renewed interest, and the admirable Shirley Williams also promotes her mother’s brilliance by example! This is on my TBR to be read without fail in 2016 – thank you for a comprehensive review! It was my summer read last year and a fabulous insight into one woman’s experience, that very much changed her and her direction. I have recently got hold of a copy of Winifred Holtby’s book Anderby Wold, which is mentioned in the book, and of course there is the volume Testament of Friendship which gos much more into this great friendship too. Happy Reading with this for 2016 Cleo, I look forward to reading your thoughts on it. Oh, I read this one a couple months ago. I’d never even heard of it until I saw the movie. How much of a shame is that? This is an exquisite book and and excruciating story. Oh, I loved this book but it was wrenching. I like the excerpts you selected–really demonstrate how beautifully Brittain could write. I do think I need to read this one of these days. I’d love to read A Testament of Friendship too, she really manages to depict the era she lived in so well and the friendship with Winifred oltby was such a positive turning point in her life. Oh yes, I’ve been meaning to read Testament of Friendship. Holtby also a fascinating person. I did read Brittian’s book about the London Blitz, “England’s Hour” and it is amazing as she describes herself scribbling writings and notes between bombings. What concentration!